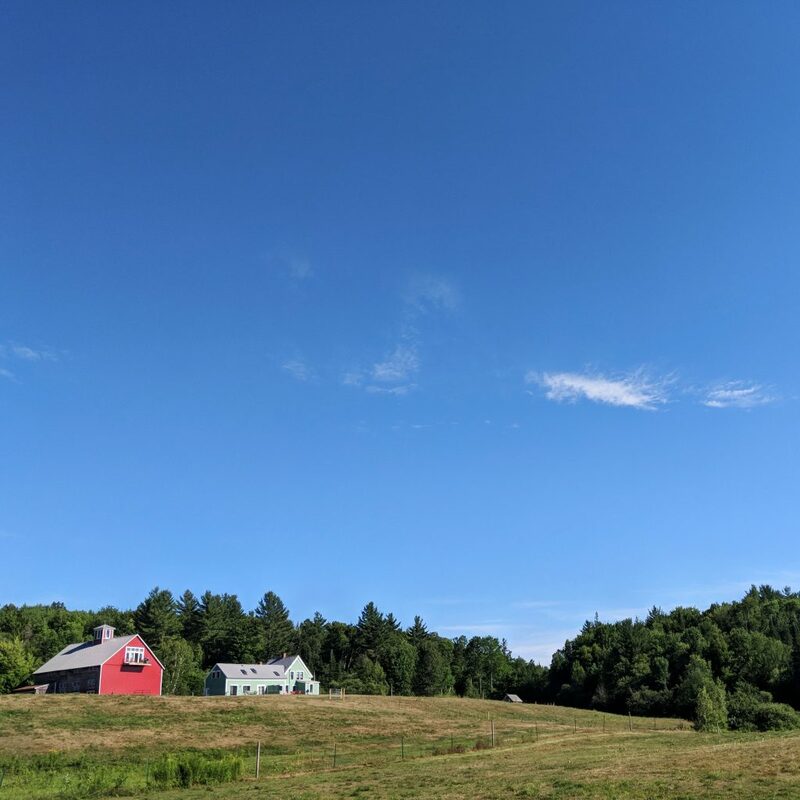 Perched between the idyllic towns of Bethlehem and Littleton, we discovered Cherry Valley Farm in New Hampshire’s White Mountains. 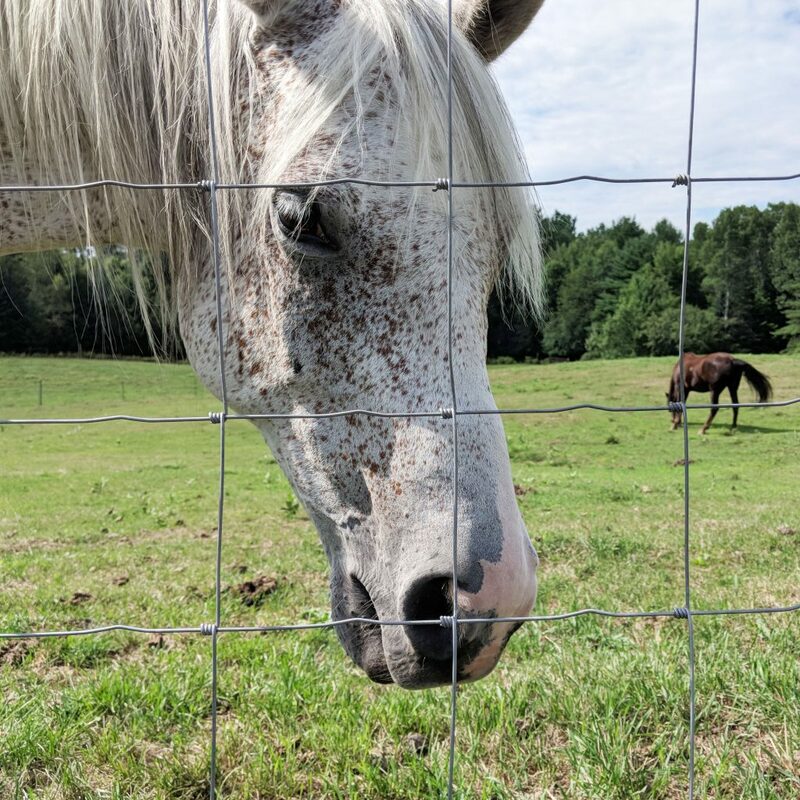 In our starkest Airbnb transition to date, we departed from Brooklyn on a Saturday morning after a month of New York City overdrive and arrived that afternoon to the soft serenity of this mountain farm. 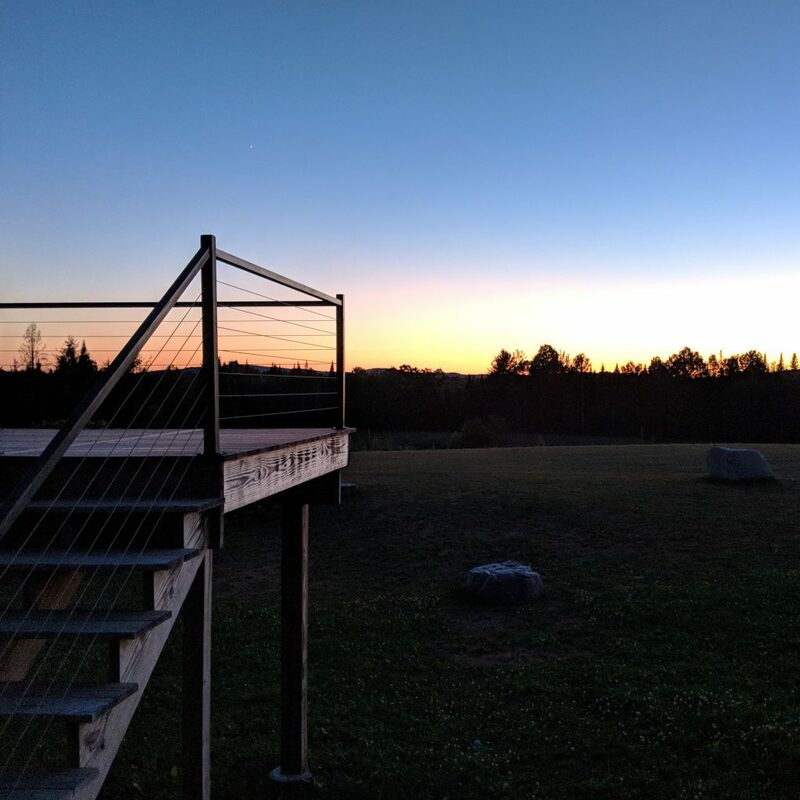 We couldn’t get enough of it: the crisp air, the remarkable view, the slow summer sunsets, the singsong bird calls with the gentle hum of crickets beneath. 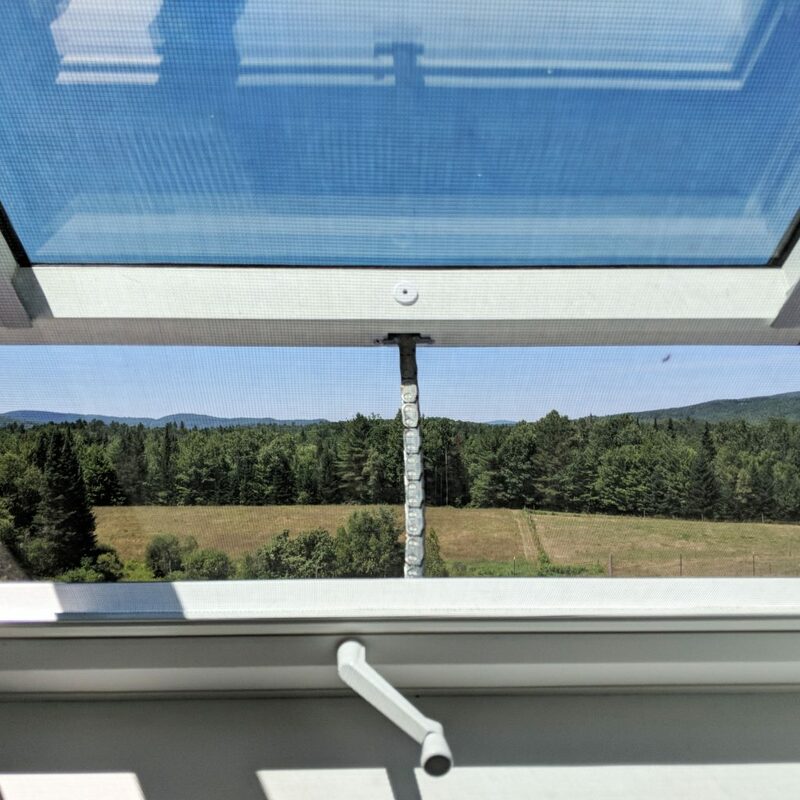 Even with the windows perpetually propped open, our surroundings were so quiet that we took notice when a hush fell over the refrigerator’s motor. And after almost six weeks, that initial awe hadn’t waned. Looking back through our photo reel, the repetitiveness is comical: a sea of nearly indistinguishable sunsets documented evening after evening. 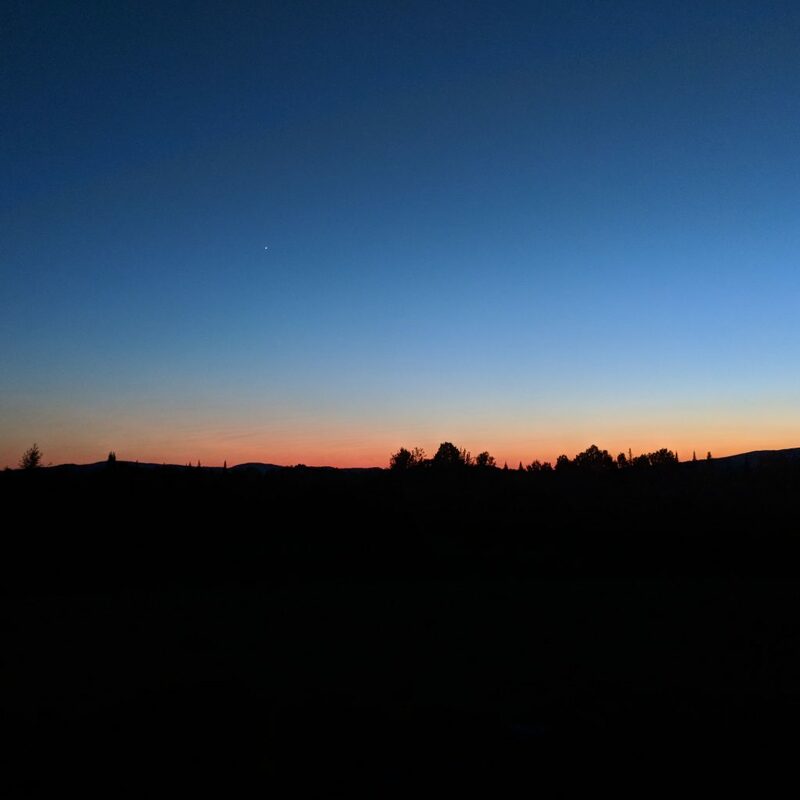 As we stepped out onto the back porch, each moment felt singularly magnificent. In our longest stay yet, we happened upon the most rejuvenating Airbnb in our travels as full-time guests. 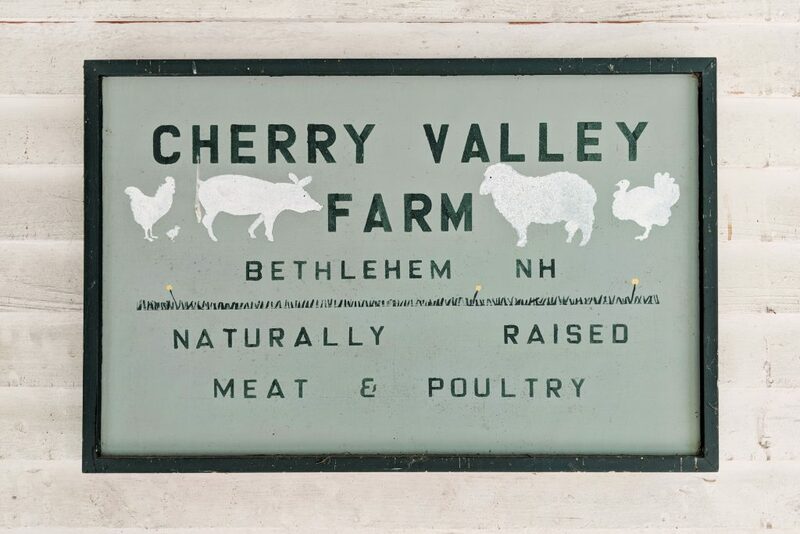 Here’s what we loved most about Cherry Valley Farm. For well over two decades, Sam and Louisa have called Cherry Valley Farm their home. 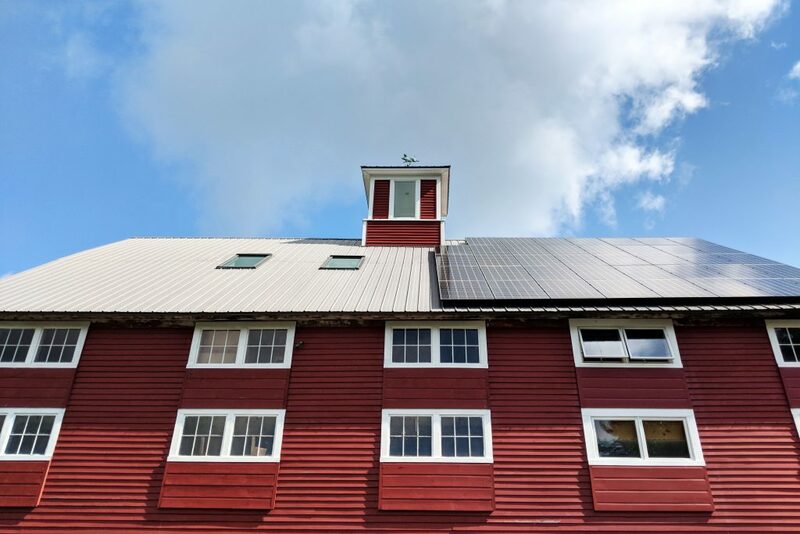 Their commitment to this 22 acre farm can be felt everywhere, from the abundant garden to the solar panels lining the roof of the towering red barn. 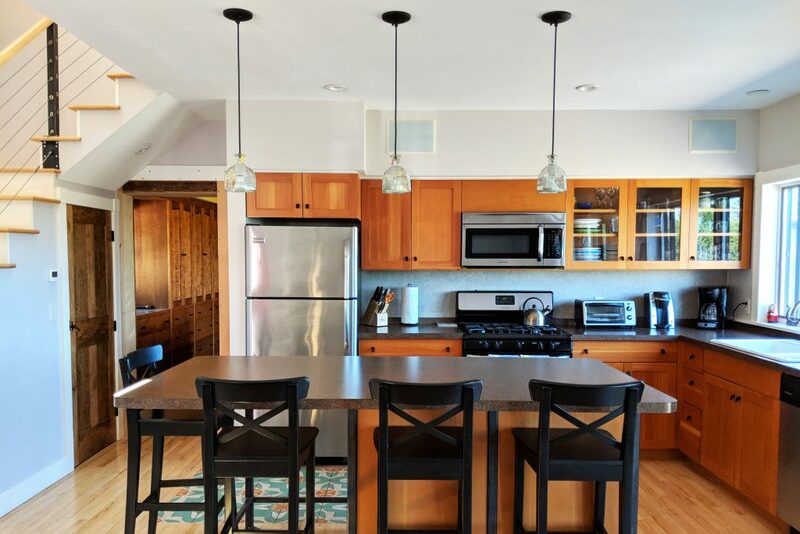 Over the years, large renovations have been coupled with unwavering daily upkeep, and their dedication has culminated in this haven nestled in the dense New Hampshire forest. After raising five kids here, they opened up their now empty nest to Airbnb guests. 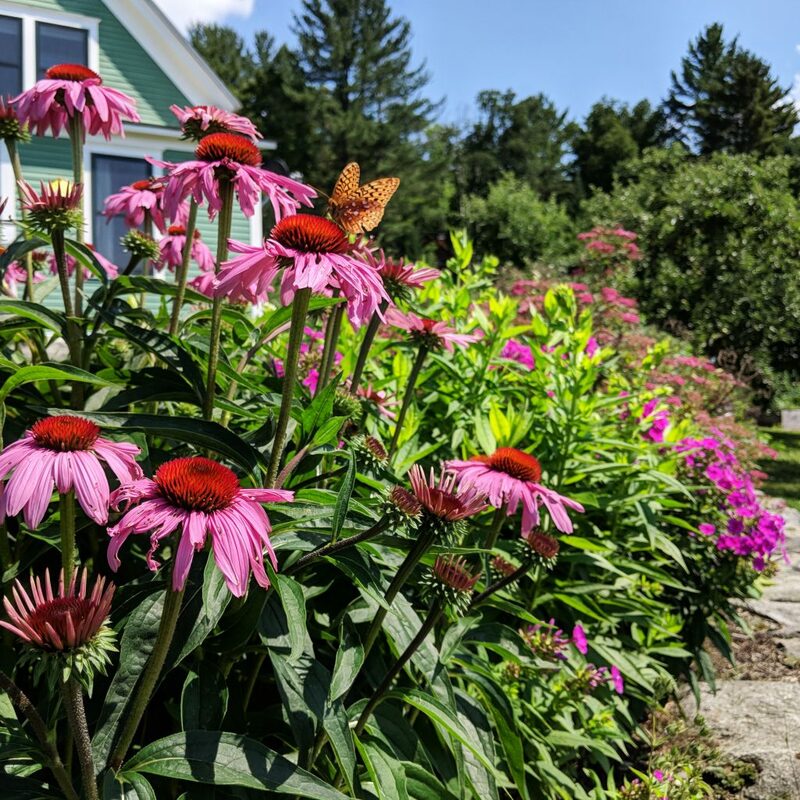 As New Hampshire natives and outdoor enthusiasts, they’re experts when it comes to the ins and outs of this White Mountains location. And their easy-going, generous spirit make them naturals as Airbnb hosts. This Airbnb packs a one-two punch when it comes to first impressions. As soon as we opened the door, we were greeted by a sprawling kitchen and cozy seating area. 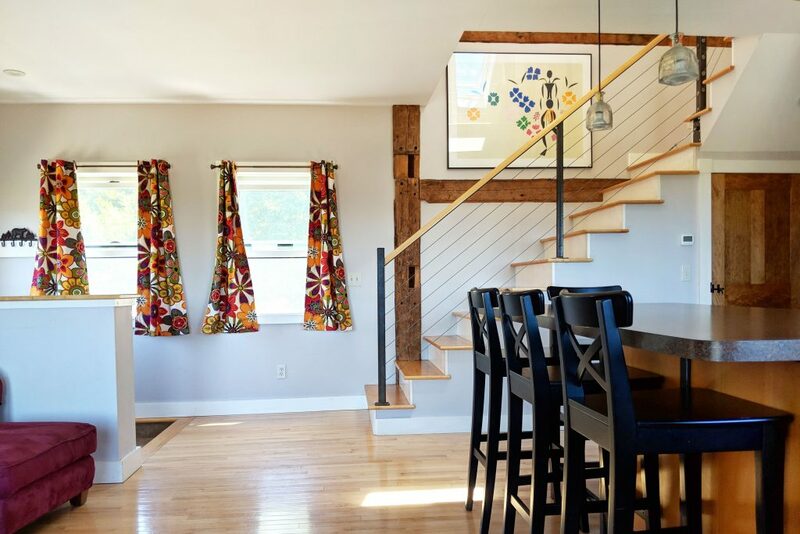 Natural light poured in from the east and the west, soft paint bumped up against thick exposed beams, and the airy staircase directly in front of the entry indicated there was a whole second floor of this stunning interior to discover. That’s punch one. Then there’s the view. The western side of the apartment is more window than wall, and the vista it frames is, well, breaktaking. The farm’s rolling fields sloped down to the rich forest. 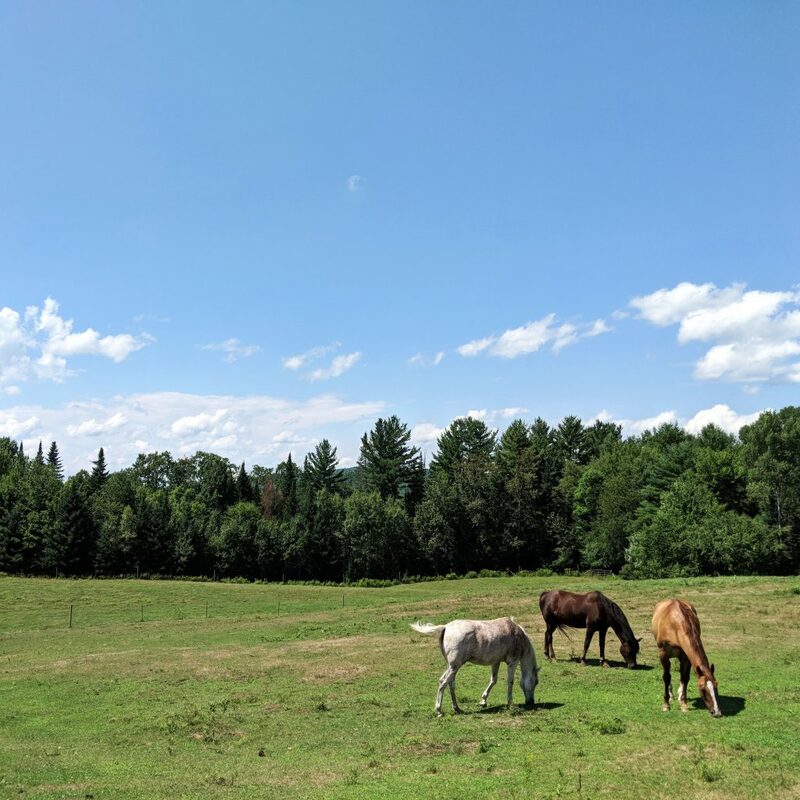 Evergreen treetops popped out against the blue outlines of distant mountains and four horses grazed beneath. 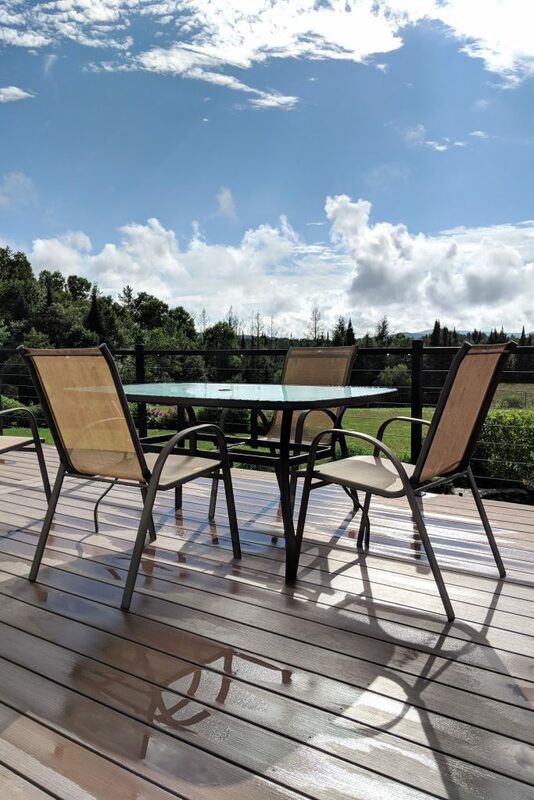 A broad, private deck extended off the apartment, inviting guests to sit back and soak in their surroundings. All this to say nothing of the adjacent living room or two bedrooms and modern bathroom upstairs. 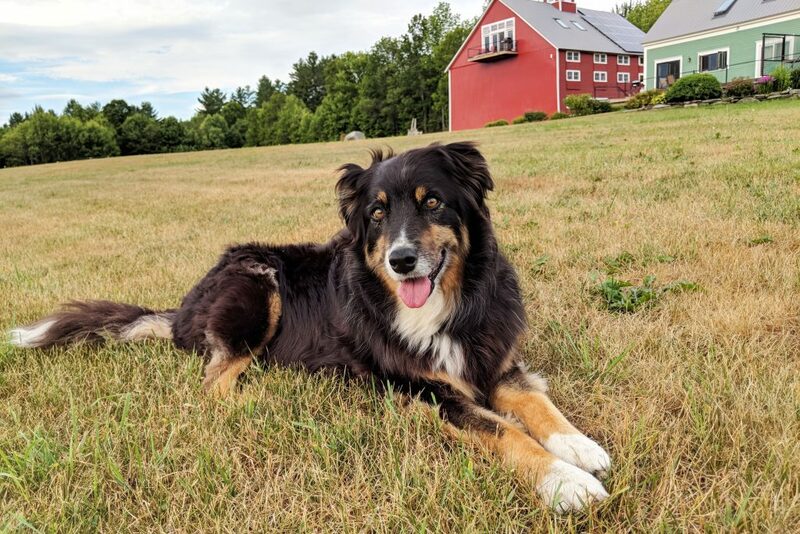 When we first came across the Cherry Valley Farm’s Airbnb listing, we saw a single theme uniting the scores of five-star reviews: Lucy, the farm dog. From the moment we arrived, our admiration for Lucy took hold just as previous guests promised it would. We opened the car door to find her trotting over to greet us. She promptly gave our dog Odin a sniff, introduced him to the yard, and walked us to our door. Over the next month, she was our dedicated tour guide, determined to make sure we got the best farm experience. At eleven years old, she’s still a herding dog through and through. At the drop of a hat, she can round up the four scattered horses without even entering their field. Her sprints along the adjoining fence provide all the instructions they need. When the horses don’t need to be herded, she’ll settle for cars, standing at the edge of the driveway directing traffic towards the road. When her tasks are complete, she hangs out with the grey, tail-less barn cat or finds a shady patch under a tree. She is the keeper for this farm, and she captured our hearts completely. Of all the thoughtful touches that made this home feel so unique, here were the pieces we appreciated most during our daily routine on the farm. 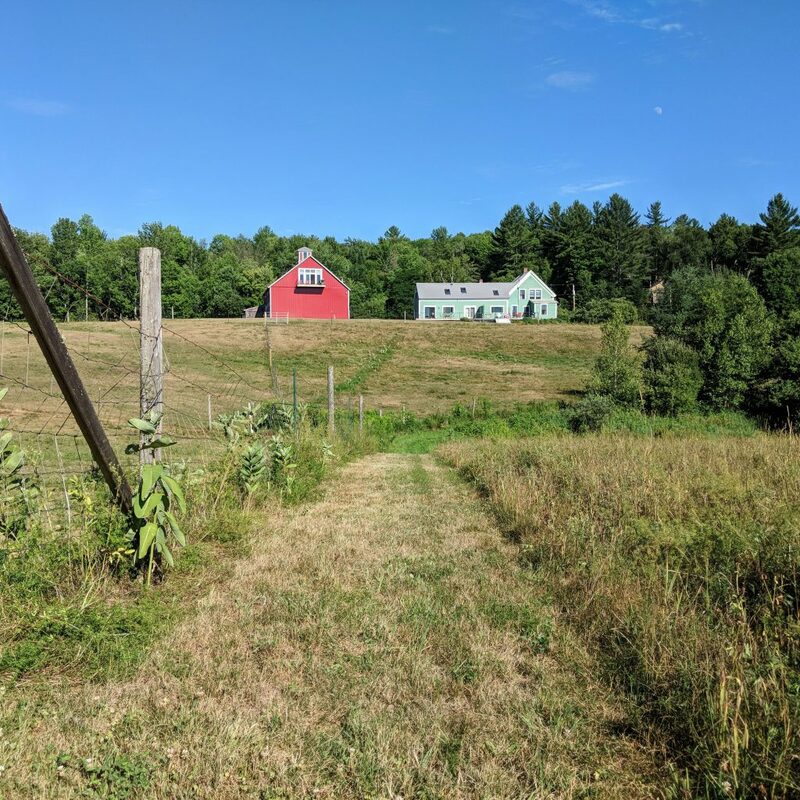 Just a few days into our stay, Sam sent us a quick text letting us know there was a trail he maintained that ran along the perimeter of the farm’s fields. Just enter next to the chicken coop, he said, and keep the fence at your left shoulder. He thought Odin might enjoy this loop, and he couldn’t have been more right. Our pup’s off-leash enthusiasm might be best described as joyful frolicking. 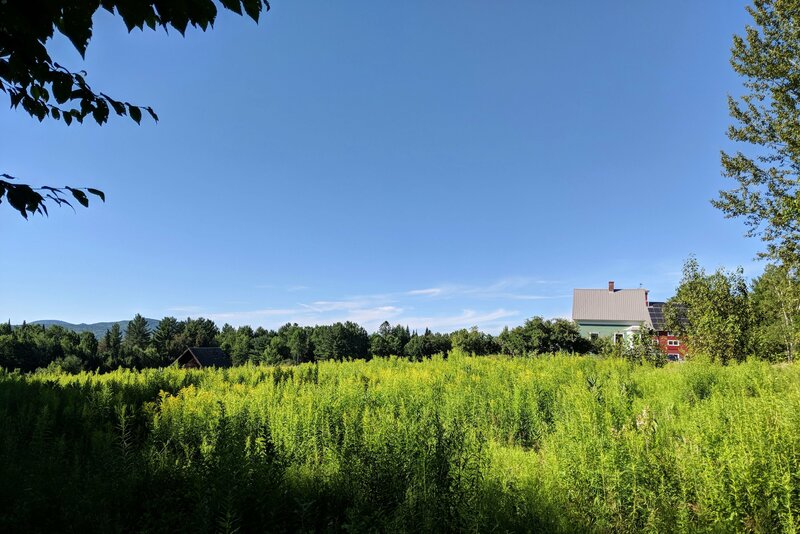 A brisk walk on Sam’s trail became our go-to afternoon pick-me-up, complete with its unique view looking up the hill towards the farmhouse and barn. 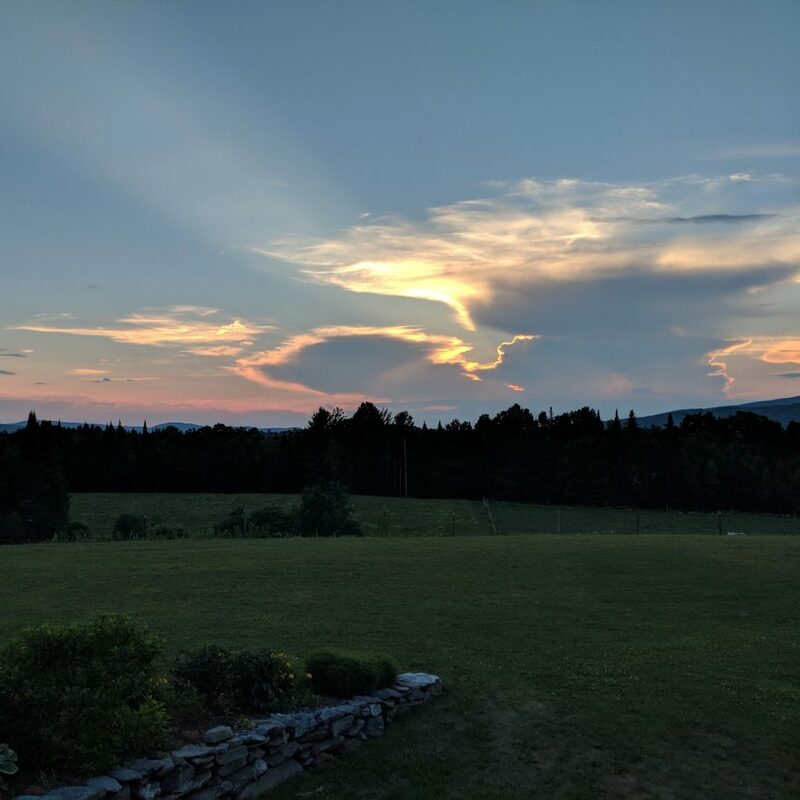 Unlike the muggy midwestern summers we grew up with, New Hampshire summer days are mild and breezy and its evenings are cool and crisp. We had the windows open constantly, including the four skylights lining the A-frame ceiling upstairs. 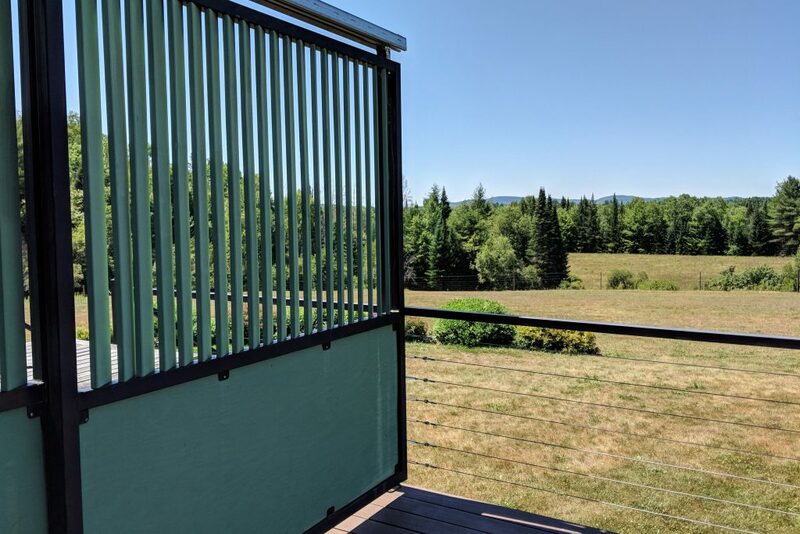 With the sturdy screens, we kept the bugs out and welcomed the sounds around us in: bird calls, horse whinnies, cricket chirps, the occasional coyote chorus late at night. The soundscape, like the sunsets, repeatedly captured our attention. On more than one occasion, we paused Netflix to confirm that the idyllic sounds we were hearing were indeed occurring in real life. Above the island in the kitchen, three lightbulbs descend from the ceiling to illuminate the countertop. 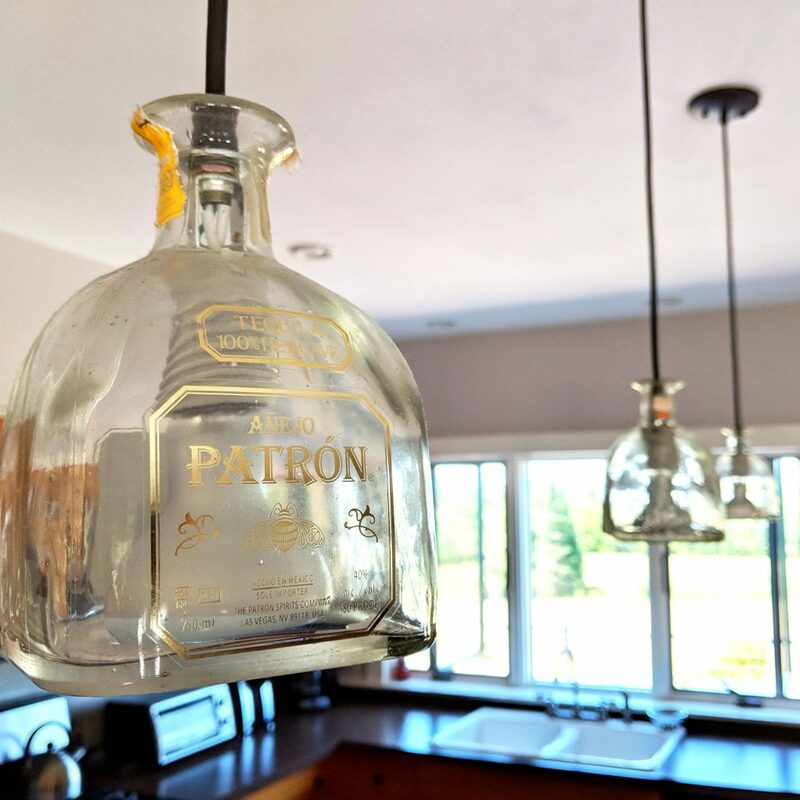 We’d been here a full day before we realized that the glass lamp shades surrounding the lightbulbs were actually Patrón tequila bottles with the bottoms cut out. These light-hearted accents add the perfect flair to this sleek kitchen, a little whimsical nod to guests welcoming them to relax and enjoy themselves. Every once in a while we’ll come across little items in an Airbnb that we look forward to using each day. The coffee mugs here were exactly that. 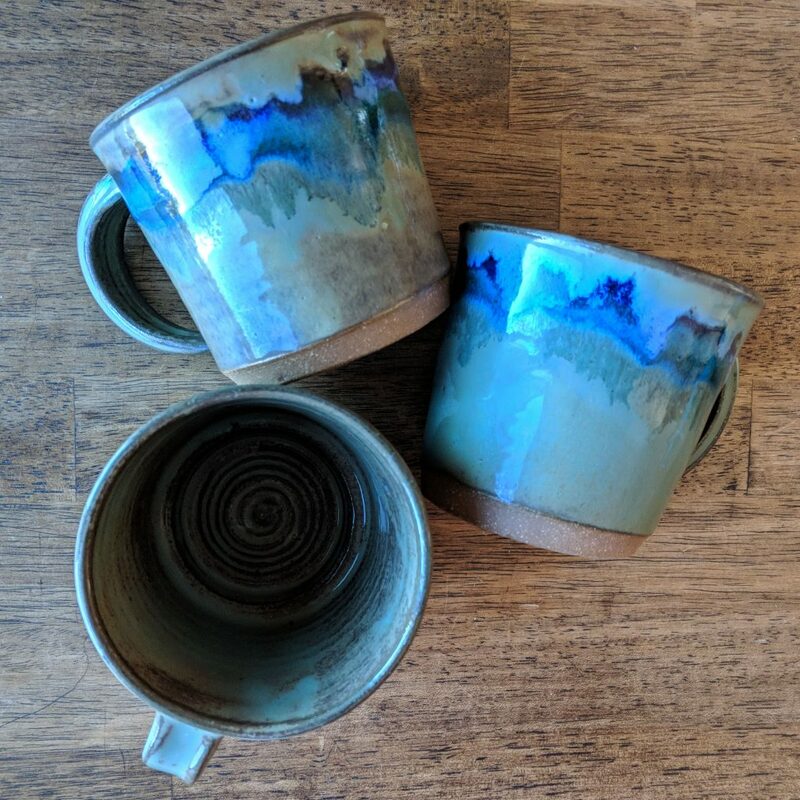 Hand-throw, with a speckled teal and watery indigo ring, these mugs were a small, tactile detail that we enjoyed each morning. Their natural aesthetic somehow primed us to better appreciate our surroundings throughout our stay. A system of taut metal wire serves as the railing that lines the edge of the interior staircase as well as the porch. Not only did this pairing create a beautiful continuity between the indoor and outdoor spaces, its transparent structure allowed light and sight right through. Indoors, this meant that the sunshine from the skylight passed over the stairs and pooled on the kitchen floor. Outdoors, it meant that we had an unobstructed view of our surroundings from just about any angle. Sam and Louisa have fantastic intuition when it comes to running an Airbnb. Here the hosting tactics that we appreciated most as guests. If you’re an Airbnb host, consider incorporating some of these clever approaches to your routine. The White Mountains have notoriously fickle weather with constantly shifting skies. One moment it’s pouring, the next the sun is casting shadows again. Sam and Louisa highlighted this local characteristic in the note we found propped up on the kitchen counter when we arrived. 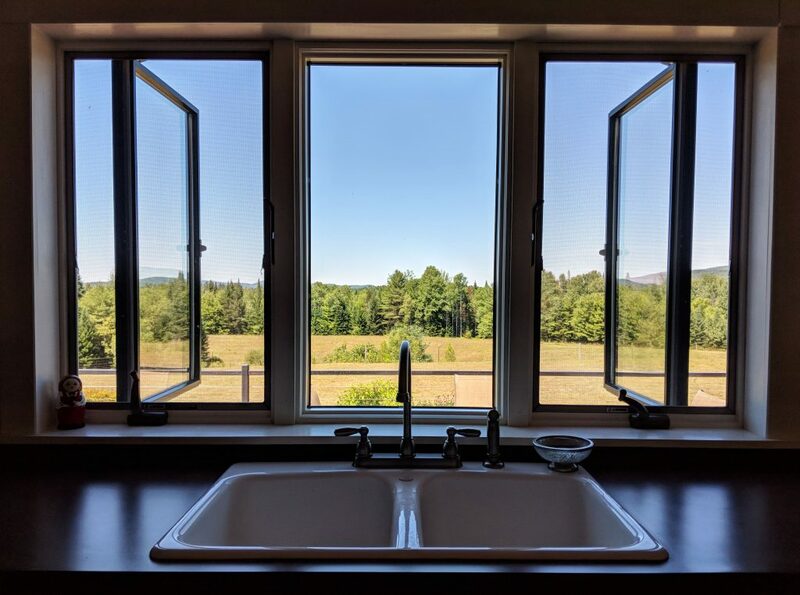 In addition to welcoming us to the farm, they asked that we close up the windows whenever we left the house. Since this was the only house rule mentioned in their welcome note, it was easy to remember and followed to a T. A myriad of rules in a house manual can often blur together for guests. By highlighting the most important one in their welcome note, these hosts set us up to be good guests. We’ve stayed with a handful of hosts who run two or three Airbnbs on the same property. 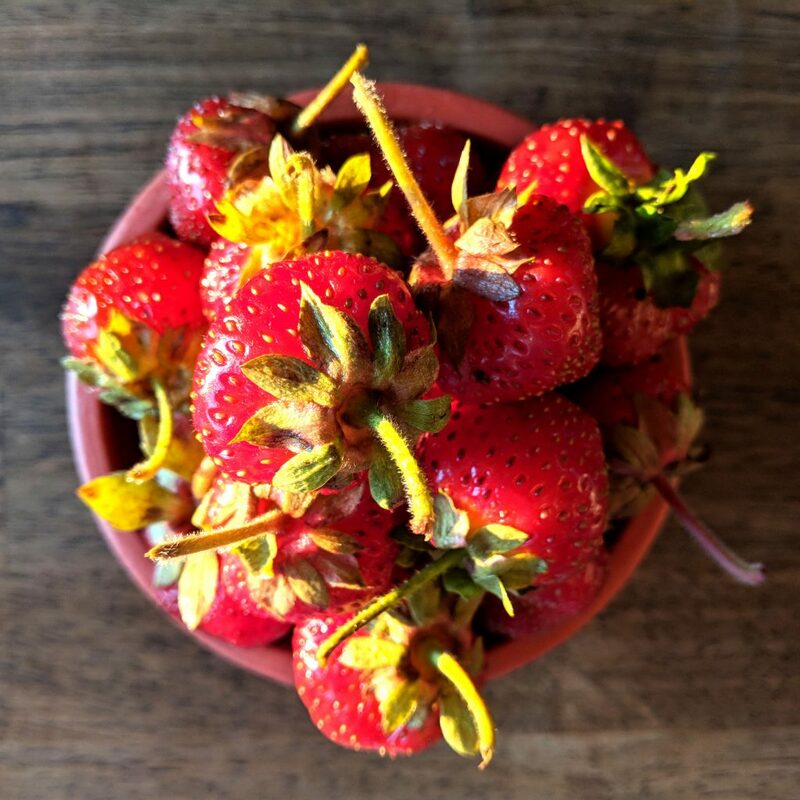 With an Airbnb in the main farmhouse and attached apartment (where we stayed), Sam and Louisa had taken a number of steps to ensure that guests in both Airbnbs enjoy the farm without stepping on each other’s toes. They designated different parking spaces and established separate entrances with their own stairs and outdoor lights. 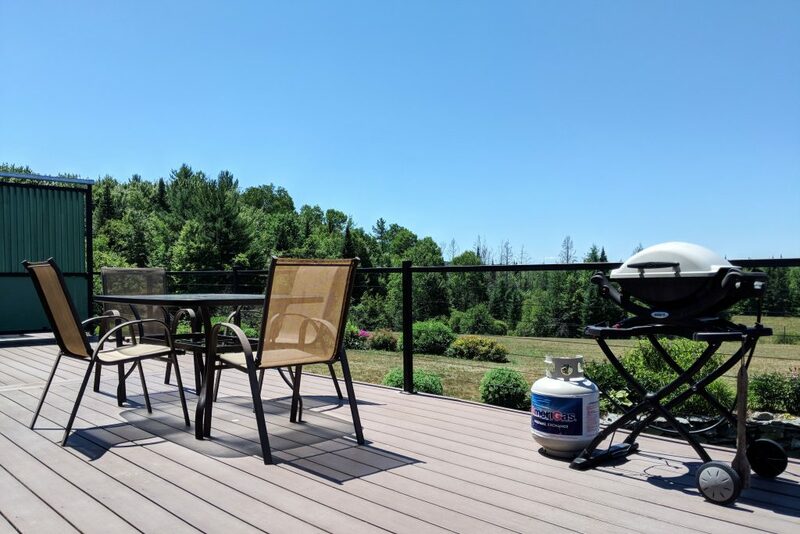 They added a divider on the deck that created privacy for parties on either side and placed the laundry machines in a neutral spot in the basement that wouldn’t intrude on either Airbnb’s space. Sam and Louisa even sent us a heads up text when other guests were checking into the larger farmhouse suite after we’d had the farm to ourselves for well over a week. This little text epitomizes the great communication we experienced throughout our stay. As full-time travelers, we’re a bit odd in that we always pack a mesh drawstring bag for laundry, but most guests don’t arrive quite as prepared. If your an Airbnb host with a washer and dryer, leave a laundry basket for your guests. As we were traveling up and down the two staircases to the machines in the basement, we were very grateful that Sam and Louisa were so prepared. 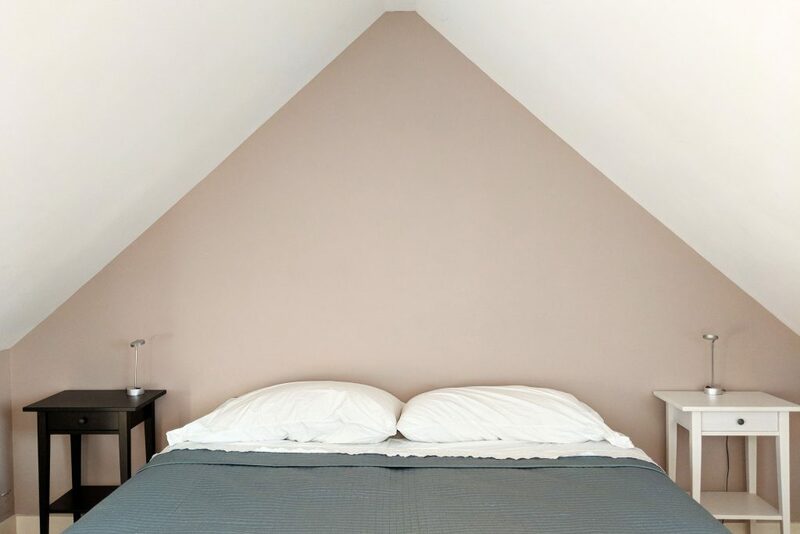 As remote workers, we love second bedrooms that can double as an office. 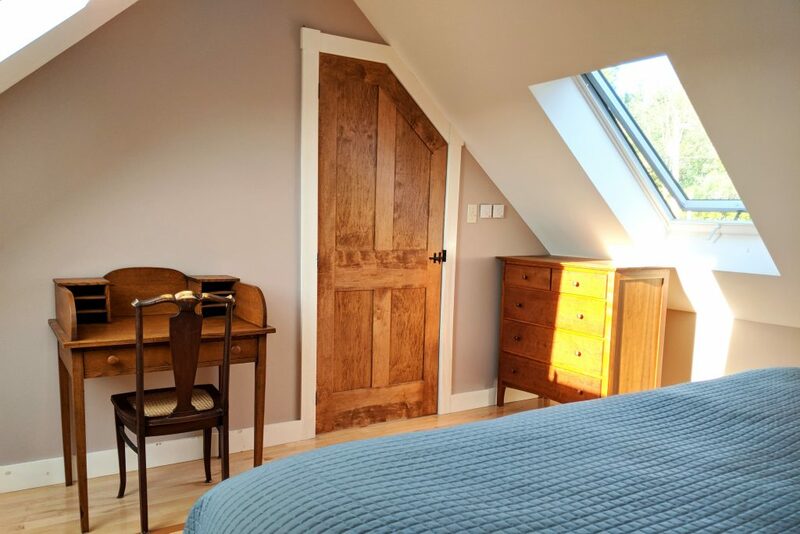 Sam and Louisa had added a writing desk and chair to the second bedroom which created a space that could mold to the needs of their guests. Additionally, they opted for two twin beds on casters instead of a single queen or king bed. This allowed guests to put the beds together or pull them apart, offering an ideal situation for all sorts of traveling companion combinations. Sam and Louisa had clearly anticipated the high traffic areas in the apartment and reinforced the floor in those spots to minimize wear and tear. The entry way was lined with sturdy tile and a shoe rack was situated next to the door, offering guests a convenient place to leave their shoes (and any dirt). In the kitchen’s central pathway, they’d added a thin vinyl mat patterned with teal tiles that looked so real we assumed at first glance that they were embedded in the floor. The last time we swung by our storage unit in Kansas City to swap out our seasonal clothing, we grabbed one item we’d never packed before: our chef’s knife. The chronic lack of sharp knives in Airbnb kitchens had finally wore us down. Of course we subsequently arrived at the Cherry Valley Farm to find knives so sharp ours was rendered useless. This little act of maintenance by Sam and Louisa made cooking in their kitchen a delightful and memorable part of our stay. 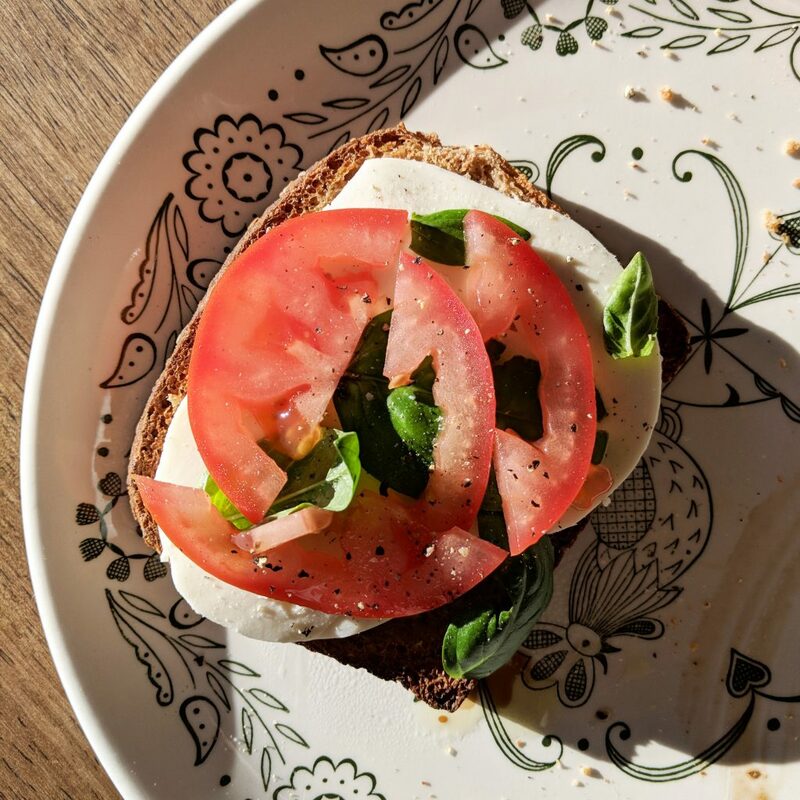 If you’re unsure whether the knives in your Airbnb need some attention, try to cut a tomato. If the knife doesn’t slice right through, it’s time to sharpen. 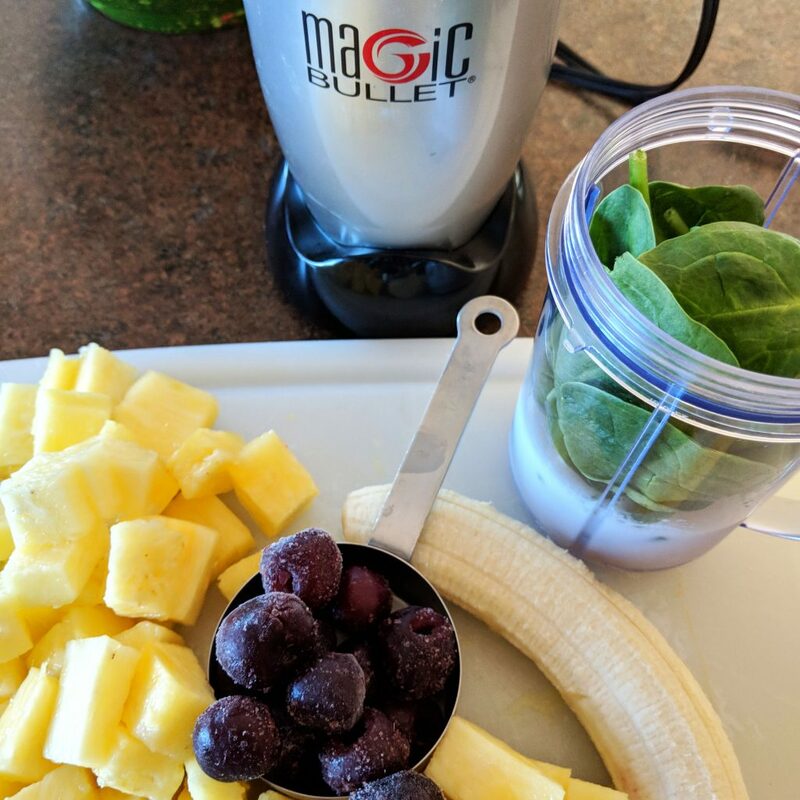 Finally, in addition to the beautiful mugs, Magic Bullet, and sharp knives, Sam and Louisa had added a few uncommon items to their Airbnb kitchen that were tailored to their unique location. 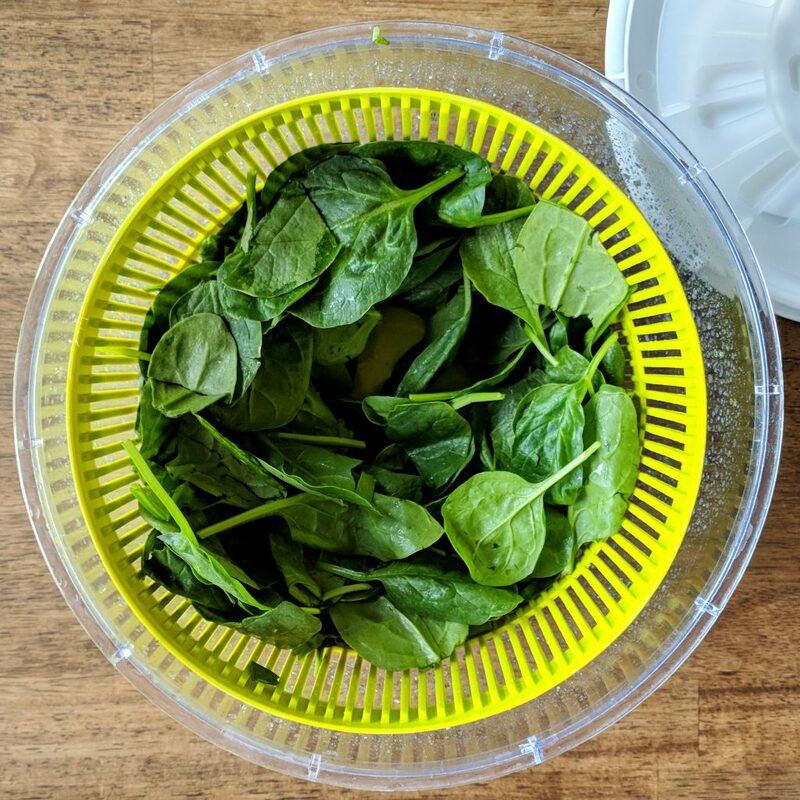 The salad spinner enabled us to enjoy the greens from their garden; an assortment of cheese graters allowed us to indulge in blocks of Vermont cheese we’d shred just before meals; and the insulated lunch boxes made it easy to pack up food for outdoor adventures. These thoughtful amenities were all items we wouldn’t think to pack as guests and yet we were so grateful to find waiting for us. Sam and Louisa had set us up to truly engage with everything their charming farm and its incredible location had to offer. We’re already sketching out our next trip to the Cherry Valley Farm. 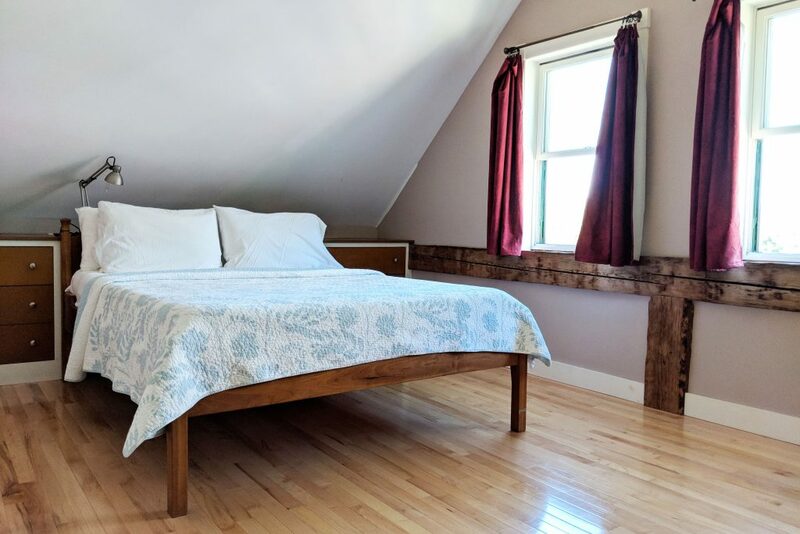 This serene Airbnb would be perfect for all sorts of travelers, but we’d especially recommend this destination for these folks. Surrounded by outdoor adventures throughout the White Mountains, this is a fabulous launching off spot for all sorts of activities. With its expansive yard, nature walk, and endless buffet of interesting smells, this is the ideal destination for guests traveling with a dog. 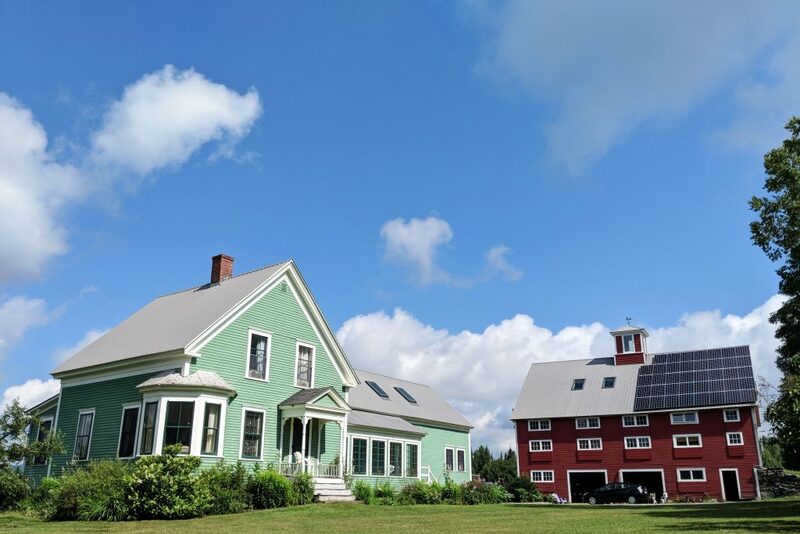 Outfitted to be a true home, the Cherry Valley Farm and its laidback living are ideally suited for anyone searching for a rejuvenating long-term stay. 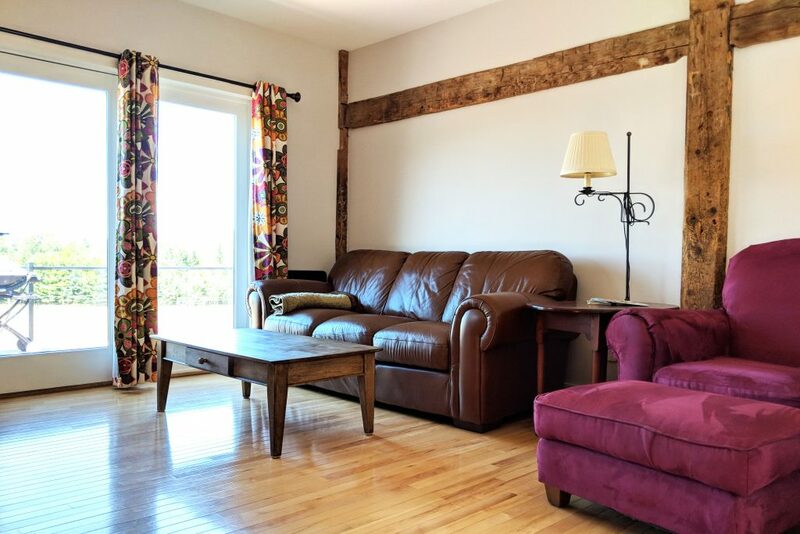 Book the Apartment at Cherry Valley Farm!